The interrelations between Physics and Mathematics caught the attention of the physics education research community. 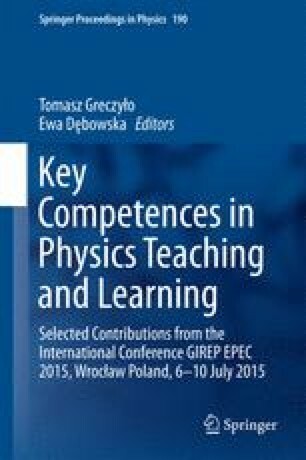 Focusing mainly on students and teachers competency, the research in physics education (PER) found that learners, at different ages and levels, lack the ability to construct the mathematical models of physical processes or to describe the physical meaning of mathematical constructs. Mathematical knowledge was also found to reflect on the quality of explanations of physical phenomena. (Clement et al. 1981; Cohen et al. 1983; Rozier and Viennot in International Journal of Science Education 13:159–170, 1991; Rebmann and Viennot 1994; Bagno et al. in Physics Education 43(1):75–82, 2007; Redish and Smith in Journal of Engineering Education 97(3):295–307, 2008; Baumert et al. 2010; Zuccarini and Michelini 2014). The approach that underlines our study adopts the view that the context of physics teaching invites investigating the interplay between physics and mathematics. This “Phys-Math” interplay is regarded as a complex two ways track by which the knowledge and understanding of physics is constructed by learners. Our multi-national group examines this subject from various perspectives: history and philosophy of science as well as its instruction in different levels from high school to university (Eylon et al. 2010; Pospiech and Matthias 2011; Lehavi et al. 2013; Pospiech et al. 2014, 2015). The present study follows our previous research in which we addressed, through interviews, the “Phys-Math” PCK of expert high school physics teachers from Israel and Germany (Lehavi et al. 2013, 2015; Pospiech et al. 2015). Here we report on a study which follows this research by analysing data collected from classes. The data was collected by videotaping physics lessons at middle school level. The videotapes were analysed, looking specifically for incidents in which Phys-Math interplay is evident.